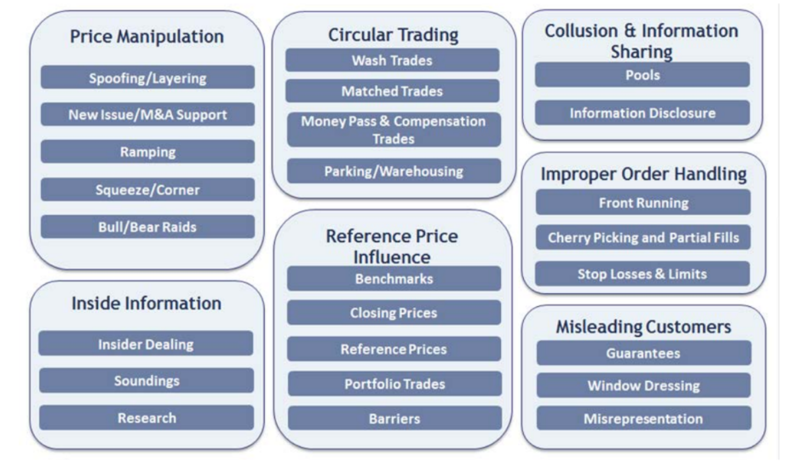 Would you be surprised to discover that despite all the changes in regulation and technology, financial market fraudsters employ the same behaviours as they have been doing for centuries. A new report has analysed nearly 400 cases over 225 years. Oldest trick – take a position in a market, spread false rumours to drive price, take the profit and run. A great example was in 1814, when investors bought a large position in UK government bonds and then handed out bill boards claiming that Napoleon was dead and the allies had had a great victory. Only today this would be done electronically and the whole scam executed in a matter of minutes. A corner arises where a party attempts to achieve a dominant controlling position in a commodity, security and/or related derivatives to influence the price of the commodity, security or related derivatives and profit from that activity. This can be undertaken to drive prices or to support them. A squeeze arises where a party does not seek dominance but attempts to gain control of sufficient amounts of a commodity or security to impact prices. Great examples are Nelson Bunker Hunt in the Silver Market in 1979 or the Porsche attempted takeover of Volkswagen in 2008.